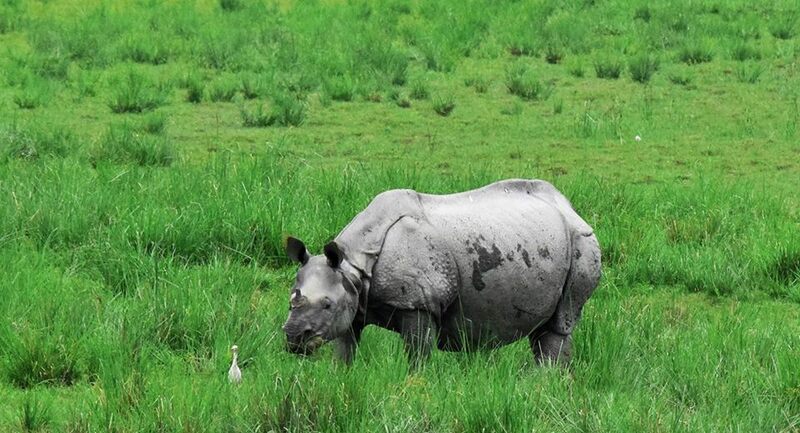 Kaziranga National Park, a UNESCO World Heritage Site is famous for its highest population of Indian One Horned Rhinoceros along with Asiatic Elephants, Indian Tigers, Asiatic Water Buffaloes, Swamp Deers, Hoolock Gibbons, Bird Species, etc. The Kaziranga National Park is spread across a huge area and is divided into four Safari zones or Ranges viz. the Central Safari Range at Kohora, the Eastern Safari Zone at Agoratoli, the Western Safari Range at Bagodi and the Ghorakati Safari Range at Burapahar. Each of these Safari zones have a large area and in order to explore the varied fauna and flora in these safari ranges of Kaziranga National Park visitors need to hire a mode of transport to explore the area in depth. The Jeep Safari tour at Kaziranga National Park is one such mode of transport. The Jeep Safari tour should be a visitors choice if he wants to explore more area in less time. Jeep Safari inside Kaziranga National Park are accompanied with escorted guards and is of two hours duration. An all terrain 4WD awaits you on your journey across one of the most diverse Biological reserves of India at the Kaziranga National Park in Assam. The Maruti Gypsy is a preferred vehicle of the Indian Army because of its known capabilities of crossing across the most difficult terrains. With no pitch roads in the interiors of the Park to preserve the habitat of the Fauna in the region the Gypsy ride will ensure you have a smooth undisturbed ride across the Kaziranga National Park. Available across the three (3) park ranges at Bagori, Kohora and Agaratoli this ride has a comfortable seating capability of 6 persons with the option of Standing on your toes once you spot the Majestic One Horned Rhinoceros at Kaziranga National Park! At a time, a maximum of four (4) such Jeep vehicles are allowed to enter the defined tourist circuits of Safari inside the Kaziranga National Park. The total ride time of these Jeep vehicles inside the premises of each Safari Zone at Kaziranga National Park is around 2 hours that starts early morning and one from early afternoon everyday. It is always recommended to visitors to have their Jeep Safari bookings at Kaziranga National Park much prior to their schedule of visit to avoid any last minute rush here. After your bookings requisite permission must be obtained to make your entry into the forest reserves of Kaziranga from the forest officials. This is not a cumbersome process and can be obtained easily from the forest offices that are present in the entrances of each of the designated safari zones. Booking of a Jeep vehicle (Maruti Gypsy or the Suzuki Vitara as called in Europe) is necessary as no private vehicles are allowed to enter the premises of the Kaziranga National Park. These Jeeps are owned and run by the local youth association of the nearby villages of Kohora and Bagori and each of these Jeeps is registered with the Kaziranga National Park authority. There are many slots of Jeep Safari available for booking from morning 7AM to afternoon 4PM everyday. After boarding your Jeep Safari and entering the premises of Kaziranga National Park visitors are to abide by the certain rules and regulations. It is strictly prohibited to get down from vehicle other than at the identified landing points only with the prior approval of the Forest guard/Driver of vehicle whoever accompanies the visitor into the Kaziranga National Park. For the safety of all tourists it is a general protocol for each Jeep to carry an armed forest guard along while going into the Safari into the forest reserves of Kaziranga National Park. The Jeep Safari begins once visitors pay the requisite entrance fees at the Safari entrance gate for the vehicle, individual travelers, all types of still and video recording devices. Central Range, Kohora Mihimukh – Kathpora – Daflang -Diffalu river bank – Monabeel -Kerasing and back with designated stop at Kathpora Tower, Daflang Tower and Kerasing Tower. Eastern Range, Agoratoli Agoratoli – Soholabeel – Rangamatia- Maklung – Turturani- Dhuba and back to Agoratoli with designated stop at Sohola Tower. Western Range, Bagori Bagori – Dongabeel – Rowmari-Rajapukhuri – Monabeel and back with designated stop at Donga Tower. Burapahar Range, Ghorakati Ghorakati – Potahibeel – Diffalu – Tunikati and back with designated stop at Tunikati Tower. Note: Above Jeep Safari rates are for the entire Jeep for 6 adults with all entry fees included. Each of our Jeep Safari rides are accompanied by a naturalist and a birding guide who guides our esteemed guests with all sighting of animals and birds here in Kaziranga National Park. Camera and Video Recording device charges are additional and not included in the above fees for Jeep Safari. Prices to reduce with lesser number of people in One Jeep. There is no sharing option available with us. At Kaziranga National Park, we organize many Jeep Safari experience for our esteemed guests. Our team owns Jeeps here that are registered with the Jeep Safari association of Kaziranga National Park and we are able to successfully conduct Jeep Safaris here at Kaziranga. Jeep Safari into Kaziranga National Park is conducted across four (4) ranges of the Park at Central range (Kohora), Western range (Bagori), Eastern range (Agoratoli) and the Burapahar range (Ghorakati). Our Jeep safari ride lasts for about an hour and a half after entry into the park and a large part of the interiors of Kaziranga National Park can be covered by this Jeep Safari across each of the Safari ranges. The most popular among the four ranges covered by Jeep Safari are the Kohora and Bagori ranges. The Eastern range and the Burapahar range are slightly away from the main center area of Kaziranga National Park at Kohora and the rush here is less as well. All the ranges are good for animal sighting especially the Indian One Horned Rhinoceros of Kaziranga National Park. Agoratoli range may offer you a chance to spot Tigers, Wild Elephants and various species of birds here at Kaziranga National Park. We narrate to our esteemed readers and future guests at Kaziranga National Park one of our Jeep Safari experiences with our guests from Bangalore. We had finished our Elephant Safari ride at the Bagori Safari range of Kaziranga National Park by 7.30 AM and returned to our guest house at Kohora by 8 AM. We freshened up and had a quick breakfast and scheduled to leave by 8.45 AM from the place to go for a Jeep Safari ride into the interiors of Kaziranga National Park at the Kohora (Central) Safari range. Krishna our team member who had also arranged for our Elephant Safari arrived with the Jeep in front of our guest house and the five of us would go for a ride at Kohora safari range. The Jeep would take us along the designated jeep safari circuit route at the Kohora Safari range starting from Mihimukh – Kathpora – Daflang -Diffalu river bank – Monabeel -Kerasing and back with designated stop at Kathpora Tower, Daflang Tower and Kerasing Tower. We reached the safari entrance gate at the Kohora range and we could see a few Jeeps waiting ahead of us making their entry at the Safari gate. At the Kohora Safari range of Kaziranga National Park Indian nationals (non VIPs) are allowed to go for a Jeep Safari ride into the park interiors. We showed our entrance tickets at the gate and started on our Jeep safari ride. The roads are not plain and the ride gets bumpy as well. The Jeep is an all open ride and once you enter the park you can stand behind to admire the varied flora and fauna of Kaziranga National Park. Just on entering the Jeep safari route at Kohora we got lucky and sighted a wild Asiatic water buffalo crossing the road ahead of us. The driver halted the jeep for a while and we admired the creature taking its walk along the wilderness of Kaziranga National Park. A little while into the Jeep safari ride we spotted few deers grazing ahead of us. Small animals these deers once inhabited various forests and wildlife reserves across the State of Assam. 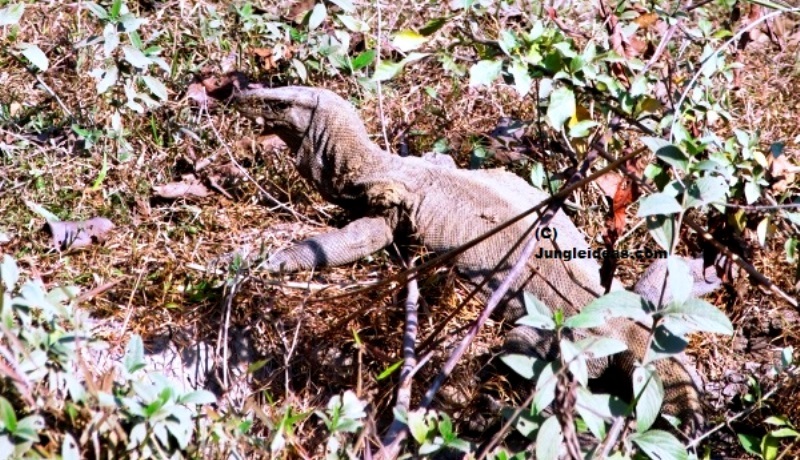 But with uncontrolled hunting their population have now been reduced to smaller numbers inside the protected National Parks and Wildlife Sanctuaries of Assam. We continued on our Jeep Safari ride into Kaziranga National Park and next up we sighted wild boars and jungle fowls in an open area here. All along the way we also sighted the One Horned Rhinoceros from a distance grazing in the open fields of Kaziranga National Park. We thought we could get lucky by being able to sight the Rhinoceros very close to us but it didn’t happen as yet. Next up we spotted a herd of Wild Elephants bathing at a poolside here on our Jeep Safari ride at Kaziranga National Park. These mighty beasts looked amazing and we waited for a while to click pictures. We also spotted various birds like lesser adjutant stork, black necked crane, barbets, egrets, parakeets, kingfishers, etc. While coming back on our Jeep safari ride we got lucky and we spotted a rhinoceros crossing our path. The driver slowed down the jeep and allowed the animal to cross the road. It went to a side behind the trees and we got lucky to click pictures from the Jeep. It was an amazing ride here at Kaziranga National Park and we were fortunate to have sighted many animals species in one ride alone. We came out of the park at around 10.30 AM. We thanked the Jeep Safari driver for an amazing ride here in Kaziranga National Park and also Mr. Krishna for all the trouble taken in arranging our safari ride into Kaziranga National Park. We headed back to our guest house taking a bouquet full of memories of our Jeep Safari ride in Kaziranga National Park. While the Bagori Safari range or the Western Range of Kaziranga National Park is well known for its Elephant Safari Rides (for Indian Nationals), this range is also a good option to go in for Jeep Safari ride as well. As many visitors prefer to do an Elephant Safari ride at Bagori and then head to Kohora range for Jeep Safari, the Jeep Safari rides at Bagori Safari range in Kaziranga National Park doesn’t see a huge amount of traffic. In this part we narrate our experience of conducting a Jeep Safari ride for a school group of 35 students and 3 teachers from Tinsukia at the Bagori Safari range in Kaziranga National Park. A little ahead into our safari ride we spotted a beautiful huge bird in the open grasslands of Kaziranga National Park. We admired the beauty of the bird for a while until it flew away. Next we continued on our Jeep Safari ride and a little ahead we spotted the Indian One Horned Rhinoceros from a close distance at the Bagori Safari range of Kaziranga National Park. We continued on our Jeep ride further into Rowmari and we spotted wild boars. There were jungle fowls around the area as well. We spotted swamp Deers from distant at the range as well. Next we continued on our drive into the park and reached at the Monabeel area and we got lucky to spot a Wild Elephant from a distant. It was an amazing sight to see this mighty beast in the wild. We started on our return drive back to Bagori. 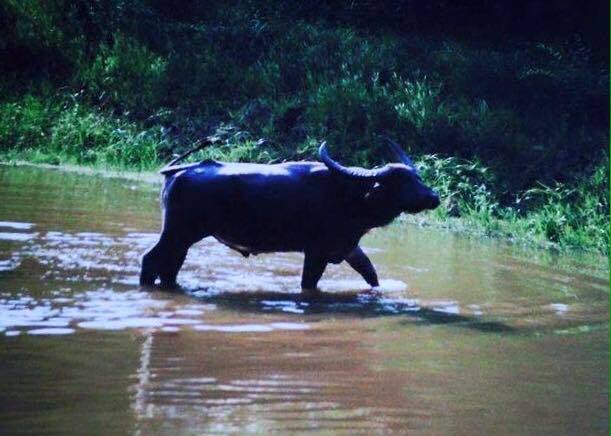 On our ride back we sighted a wild Asiatic Water Buffalo in a water pool. The animal looked majestic and Kaziranga National Park is home to the highest population of Asiatic Wild Water Buffaloes in the world. 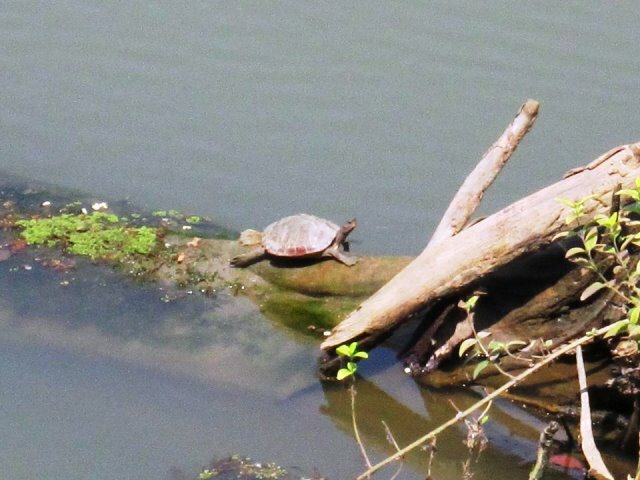 We inched a little ahead and got lucky to see an Assamese Roofed Topped Turtle waiting by the pond here in Kaziranga National Park. There were many other species of birds we spotted here as well. On our way back we spotted another huge adult Rhinoceros from a close distance as well. We came back to the entrance point and took a right to make a final stop at the Donga Watch tower area here at Bagori Safari Range in Kaziranga National Park. Here everyone got down from their Jeeps and we admired the vast forest expanse of Kaziranga National Park. Here everyone posed for a group picture with the students and the faculty members. There is a huge lake area here at the Donga Beel and there are many species of fish to be seen here. We could see the ‘Sital’ fish jumping on the waters of the Donga Beel. It was lovely to sight these species here. We boarded our Jeeps again and came out of the park at 10 AM after completing an hour and a half long ride of Jeep Safari in Kaziranga National Park at the Bagori Safari range. We thanked all the drivers once the safari ended and alighted the bus to go back to Kohora range in Kaziranga National Park. One of the most unique experiences of enjoying your Jeep Safari ride in Kaziranga National Park is at the Burapahar Safari range. The Burapahar or the Ghorakati range is located on the outskirts of the main area of Kaziranga National Park from Kohora (a distance of about 25 km). Many tourists to Kaziranga National Park are unaware of this range and hence do not visit here leaving the place less crowded and hence best to explore. This Jeep Safari range in Kaziranga National Park covers a larger area than the other ranges around here and hence takes a longer duration to cover as well. Over the years we have conducted a few Jeep Safari ride experiences for our guests at the Burapahar safari range and here we narrate our experience of hosting our guests from New Delhi on a Jeep safari ride at the Burapahar Safari range. 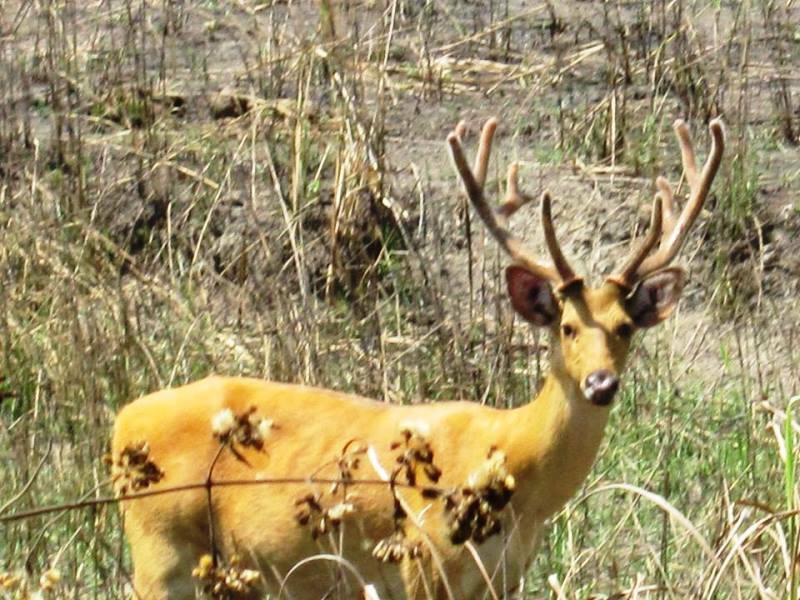 The Burapahar range of Kaziranga National Park is famous for the deer species found in the park of the likes of Hog Deer, Swamp Deer, Sambar Deer, Barking Deer and Indian Muntjac and indeed it is true as we were able to spot 3 of the deer species here on our Jeep safari ride. A little ahead into the ride we sighted the Indian One Horned Rhinoceros from the Jeep. An amazing beast, the adult female rhino was grazing along with her calf here. Next up continuing on our Jeep Safari ride we spotted a herd of Wild Elephants waiting by a water pool. 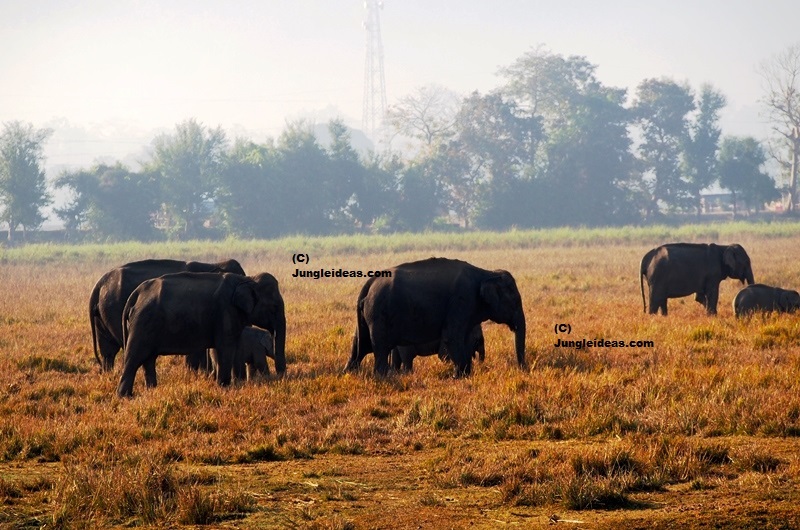 It was a magnificent sight to see these huge mammal species of Kaziranga National Park in the wild. We were also lucky to sight Asiatic Wild Water Buffaloes and various species of Birds like Great Indian Hornbills, Pelicans, Cormorants, Snake Bird species, etc. It was a wonderful experience enjoying our Jeep Safari ride at the Burapahar range of Kaziranga National Park. We didn’t realize how our time passed away and two hours were up soon. At around 3.30 PM we came out of the park and boarded our car back on our journey to Guwahati. In the month of December 2018 we conducted our Kaziranga tour package with our guests from New Delhi. Across most of our tours our visitors from India choose to have an Elephant Safari ride in the morning from the Western (Bagori) safari range and then they prefer a Jeep Safari mostly at the Central (Kohora) safari range. But our guests this time were nature enthusiasts and animal lovers as well and so they did not want to take an Elephant Safari ride into Kaziranga National Park but opted for Jeep Safaris across all four (4) ranges of the park. In this piece we narrate our experience of hosting them on a Jeep Safari ride into the Agoratoli range of Kaziranga National Park. The Agoratoli safari range entrance is located about 23 km away from the main center point of Kohora in Kaziranga National Park. This distance factor makes Agoratoli range a less frequented range by the army of tourists who come every year to Kaziranga National Park. With the solidarity inside this range as not many Jeeps go in for a ride is what makes the Agoratoli range one of the best ranges for bird watching here in Kaziranga National Park. 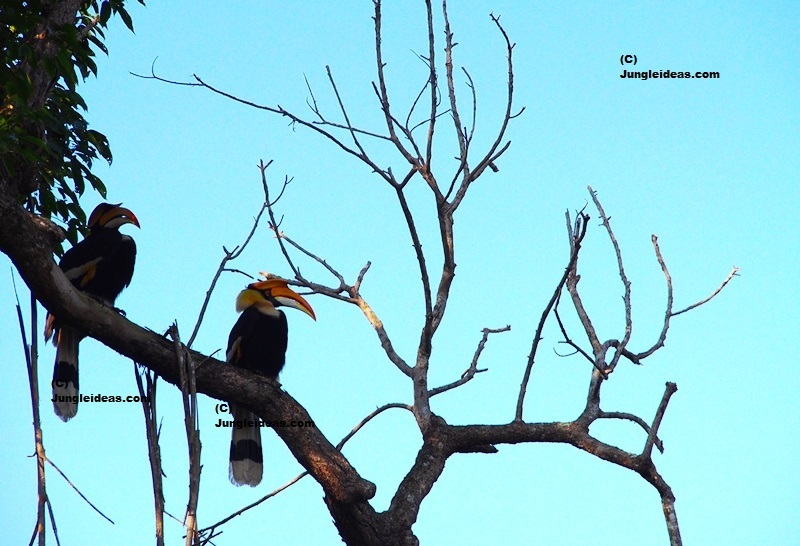 Some of the bird species to be spotted on your Jeep Safari ride here are Bengal floricans, Great Hornbills, Wreathed Hornbill, Greater Spotted Eagles, Spot-Billed Pelicans, Black necked Storks, etc. 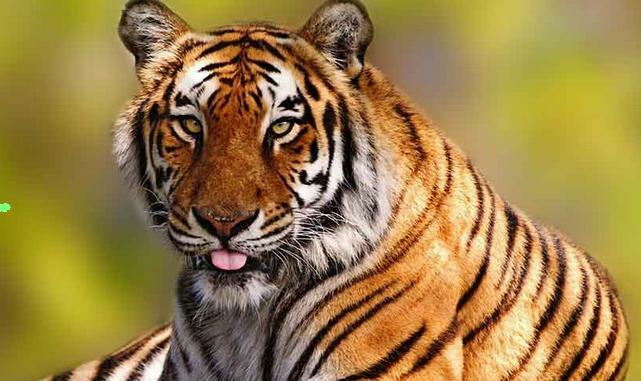 Agoratoli range is also where tiger sightings often happens in Kaziranga National Park. Wild Elephants, Asiatic Water Buffaloes, Indian One Horned Rhinoceros, Hog Deers, etc are also common sightings here at the Agoratoli range as well. But visit this place on a Jeep Safari ride if you are an avid bird watcher and want to enjoy your safari in calm. The time of Jeep Safari scheduled inside the park was for 2 hours. A short while into the ride near the Soholabeel area our guests had their first sighting of the Indian One Horned Rhinoceros of Kaziranga National Park. They even spotted it from a very close distance as well. Next up there were a few bird sightings of the likes of Pelicans, Hornbills, Bar Headed Goose, Herons, etc. It was an amazing experience for our guests to be able to sight these magnificent species in the Wild. Proceeding further near the Maklung area they were able to sight a herd of Wild Elephants by a pool of water. Proceeding further at the Dhuba area they sighted Asiatic Wild Water Buffaloes and Hog Deers. This was the Jeep Safari ride end point and they started on their ride back to the entrance of the Agoratoli range. 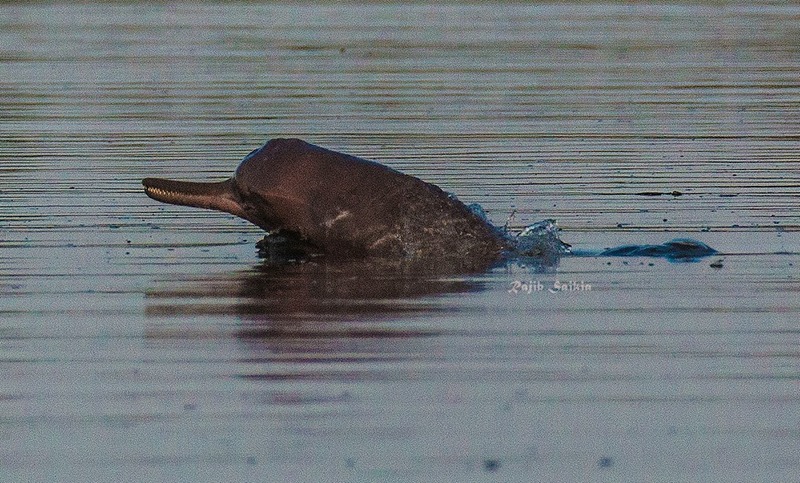 Along the way they sighted more species of birds like Darters, Barbets and the very grand Black Necked Stork species. There were other migratory bird species as well. They finally arrived at the Sohola tower area where they made a stop for pictures. At around 10.15 AM they were out of the Agoratoli safari range and went back to their Resort to pack their belongings and head on their journey back to Guwahati from Kaziranga National Park. We had a last minute plan to visit the Kaziranga National Park and we had contacted this team from Jungleideas to help us with our bookings here. Krishna from the team assisted us with the airport transfers, accommodations, Elephant and Jeep Safari bookings. Our Jeep Safari ride was a highlight of the visit to Kaziranga National Park. We took our Jeep Safari ride at the Eastern range of Kaziranga National Park at Agoratoli and this was an good choice as not many tourists were around in this range. We could sight various animals like rhinos, elephants, hog deers, wild buffaloes, sambar deers and many bird species. Thank you Krishna for all the arrangements and your support. Looking forward in visiting Kaziranga national Park again soon. Krishna assisted us with our Jeep Safari bookings at the Western range of Kaziranga National Park. We choose the western range on his recommendation and did not regret the decision as our main motive of sighting the Indian One Horned Rhinoceros in the wild was fulfilled. 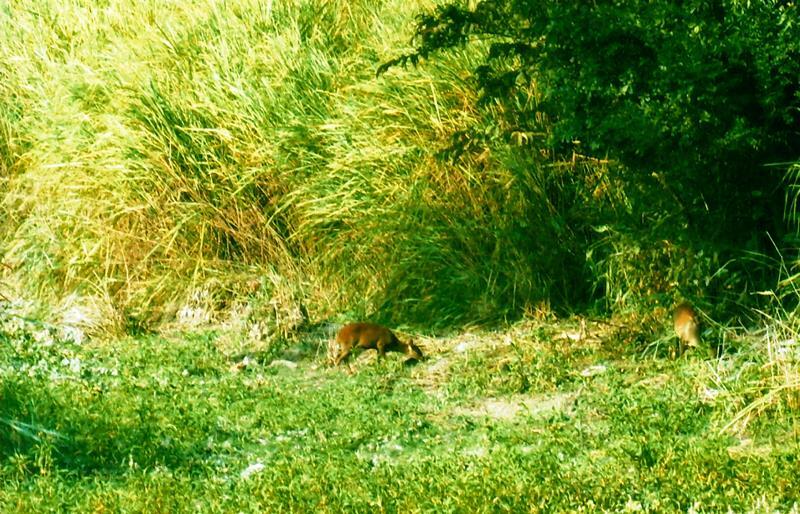 We spotted more than 15 of them here at Bagori in Kaziranga National Park on our jeep safari ride. Krishna has also assisted us with our accommodations at Kohora in Kaziranga National Park and the pick up and drop from the guest house to the safari point. It was a really amazing experience and all thanks to Krishna for the arrangements. I was on a visit home at Tezpur in Assam from Bangalore where I work. A few friends and myself had made a last minute plan to visit Kaziranga National Park from Tezpur and wanted to do a Jeep Safari ride at Kaziranga National Park. I contacted Arunav who guided me to Krishna to arrange for our Jeep Safari at Burapahar range the very next day itself. Krishna assisted us with the booking process and our Jeep safari ride was confirmed. The next day we reached Kaziranga National Park but due to heavy rains the previous night the Jeep safari at Burapahar was not being conducted. Krishna immediately arranged to take us to Bagori Safari range and our Jeep Safari ride was conducted here. It was a wonderful experience sighting the varied species of flora and fauna here. He also refunded the amount that was additional for Burapahar range. Thanks to the team who were so accommodating and helped make our visit to Kaziranga National Park a memorable one. Thank you again. We took our tour of Assam and Aruanchal Pradesh with this team and Krishna made all arrangements for us from booking our vehicles, accommodations, permits, safaris, etc. We took our Jeep safari rides at Kaziranga National Park at the Eastern, Burapahar and Western ranges. The Jeep that took us along was in a very good condition and we were accompanied by Krishna, the Jeep driver and a forest guard. All of them were equally knowledgeable about the terrain of Kaziranga National Park (language was a barrier though that Krishna bridges successfully) and Krishna himself being an avid birdwatcher and photographer helped us identify various bird species on our Jeep Safari ride across the ranges. The forest guards played his bit by making us see various animal species as well. All thanks to Krishna and Arunav for their efforts and organizing and executing our tour perfectly. Looking forward to visit North East India again during the Hornbill festival of Nagaland with this team. This was our first visit to North East India and we were covering Assam, Arunachal Pradesh and Meghalaya across 9 days. Arunav was my batch-mate in college while we were pursuing our masters and he was known to be a guy who executed all his tasks with responsibility and precision. So I ensured to book my North East tour with him. As he was busy during our time of visit he entrusted Krishna from the team to make all arrangements for our tour and he ensured to answer all our queries and design a customized itinerary for our tour. We took Jeep Safari at the Western range of Kaziranga National Park in the afternoon and guess what we got lucky to spot the tigers of Kaziranga National Park. The Jeep driver informed us that only a lucky few visitors get a chance to sight tigers here at Kaziranga and we were blessed to have this opportunity! We also spotted many rhinoceros here along with capped langurs, hoolock gibbons, deers, sambar deers, hog deers, wild elephants, wild boars, jungle fowls, Asiatic wild water buffaloes, etc. Out tour was well planned and executed by this team and we look eagerly in exploring more of North East India especially Assam and Nagaland with them. Our last minute plan to visit Kaziranga National Park and to enjoy our Jeep safari ride at the Burapahar range turned into a hurdle as we couldn’t find any Jeep Safari operator ready to conduct the safari at Burapahar range as this range is far from the main central area of Kaziranga National Park. We got in touch with this team and Krishna readily agreed to assist us with our Jeep Safari rides here. Our safari ride was confirmed upon paying a nominal amount as advance towards our booking. We arrived at the entrance of the Burapahar Safari range of Kaziranga National Park the next day and the Jeep was awaiting our arrival. Jadu the jeep owner had come along with his Jeep and he took us into the forest reserve of Kaziranga National Park at the Burapahar range accompanied by a forest guard. There were no other safari rides and we were the only people taking this ride. We chose Burapahar as the ride is longer here and takes us quite inside the forests of Kaziranga National Park. The Jeep ride was interesting and we spotted many rhinoceros, hog deers, Asiatic wild elephants, Asiatic wild water buffaloes, wild boars, deers, jungle fowls and various bird species of Kaziranga National Park. Thank you for all the arrangements and awesome Jeep ride! We were travelling from Kerala and had priorly booked our jeep safari ride at Kaziranga National Park at the central range. However, we were arriving early afternoon and hadn’t planned on taking any safari and so we made a final plan to visit the Burapahar range and enjoy our Jeep safari ride here. Krishna arranged for our jeep safari the very next day afternoon at Burapahar range and we were greeted on our arrival at the Burapahar range by him. As our visit coincided with the Assamese New Year of Rongali bihu there were many visitors to Kaziranga National Park but interestingly only a few people were here at the Burapahar range. The Jeep ride went well and we spotted various animals and bird species,. Thanks to Krishna for all the arrangements. I was travelling with my family (my wife and young son) and was not aware much about the Jeep safaris being conducted in Kaziranga National Park. I happened to come across this website and got a fair idea of exactly in which safari ranges of Kaziranga National Park Jeep Safari was being conducted. As we wanted to stay away from the very touristy circuit we choose Burapahar range and Krishna helped us with our Jeep Safari bookings here. The safari ride was confirmed upon payment of a token amount as advance and we reached Kaziranga National Park for our safari day here. The Jeep picked us up from our place of stay in Bagori and the driver took us on a well guided ride inside the forest reserves of Burapahar. The Jeep rides was amazing and we ended up sighting various animals and birds with the highlight being the flagship species of Kaziranga the Indian one horned Rhinoceros. Thank you team for all the help and arrangements. We booked our Jeep Safari with these guys for our visit to Kaziranga National Park in April 2019. Krishna assisted us with the bookings and ensured that our Jeep picked us up from our place of stay in Kaziranga National Park and took us to the Western range of Kaziranga for Safari. It was a wonderful experience working with him. Thank you!